Whether you are in a serious relationship or single AF, you definitely need to treat yourself to something special this Valentine's Day! 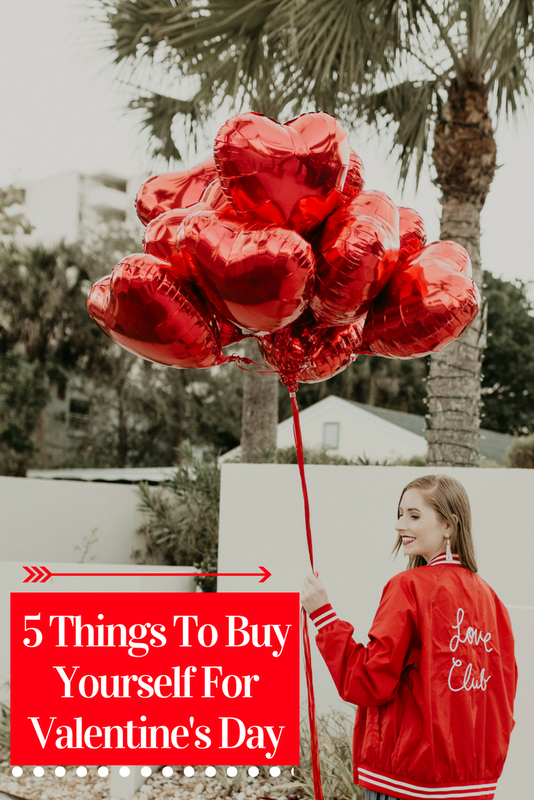 Keep reading to see my 5 Cute Valentine's Day Gifts to Buy for Yourself this year. This Valentine's Day doesn't have to be limited to celebrating people in relationships. You should treat yourself to something even if you are planning on buying presents for your significant other. One of my favorite accessory brands is Lisi Lerch. I own a pair of gold earrings, slate gray disc earrings, and long tassel earrings from their collection. HERE I am wearing the gold pair. HERE I am wearing the gray disc earrings. Both of them are favorites of mine! What makes these EARRINGS fun is the drama they bring to the table. You can have on a basic white t-shirt and denim boyfriend jeans and as soon as you whip out you tassel earrings consider your outfit complete. The Lisi Lerch brand has a ton of options to choose from in terms of color, too. You can find a pair of tassel earrings to match any outfit or special occasion. I am a sucker for a good, thick moisturizer that really WORKS for my combination skin. Sephora has the best of the best. Sunday Riley is well-known for their amazing line of skin care products. From their Good Genes Lactic Acid Treatment to their Martian Mattifying Melting Water-Gel Toner, I can't get enough of their beauty items to improve the look and feel of my parched skin. The C.E.O moisturizer is fairly new but works wonders for women needing an extra boost of Vitamin C in their skincare routines. Including Vitamin C in your skincare is important to protect your skin from signs of aging. Get glowing skin once you introduce this potent moisturizer into your day or nighttime skincare. I've been using it for a few months now and it's been wonderful at targeting my dark spots and further lightening up my complexion from sun damage. I already own the Naked 2 Palette and the Naked Basics eyeshadow palette, but when I saw the Heat colors, I stopped everything and drove straight to Sephora to pick it up. I have blue eyes and the copper tones could bring them out in a way that my other eyeshadow palettes do not. I'm not always wearing eyeshadow, but when I do I mix in dark browns to accentuate the blue in my eyes. The shimmery pinks and muted browns within this palette are my go-to colors right now. I wore colors from this palette on New Year's Eve, too. When I put on such a dramatic copper eye look, I usually follow it up with some winged eyeliner using THIS eyeliner from Stila. If you are looking to purchase a fun beauty item for yourself this Valentine's Day, I suggest the Naked Heat Palette. You can have so much fun experimenting with many eyeshadow looks, just search for some on Pinterest for inspiration like I love to do! Are you sleeping on a silk pillowcase yet? You need to hear why you should invest in one! Valentine's Day is the perfect excuse to pick one up to protect your delicate face from premature aging. Not all pillowcases are treated the same. A SLIP Silk Pillowcase is your key to great skin for life. What makes this pillowcase so special is its ability to keep your skin moisturized all night long without disrupting your well-deserved beauty sleep. You'll feel like you are sleeping on a soft cloud, too. Ok, so I caved. I found a way (an affordable way, too!) to finally experiment with the white bootie trend. I found these STEVE MADDEN boots and wore them all throughout the Galentine's Weekend party last weekend in Siesta Key. The verdict? I absolutely love them! I find them easy to style, too. Dresses, skirts, and denim jeans pair beautifully with these hot white booties. I think they will continue to be popular shoes throughout spring and into the summer months, so I'm glad I found them when I did at PacSun. Of course, white is such a difficult color to keep clean, so every now and then I will spot clean these boots with a small amount of dish soap and water to make sure they will last.